These are rigid couplings with ultra-high torsional stiffness that were developed for servo motor applications. Unlike flexible couplings, they have no element to absorb differences between the centers of the two shafts, so they have very high torsional stiffness. 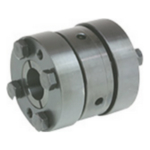 Since the outer diameter relative to torque can be reduced compared to flexible couplings, smaller couplings can be used, which helps reduce the moment of inertia.